... according to the twelfth-century historian William of Malmesbury. For some reason I find this passage very funny. "There was more rashness and headlong fury than military skill in their conflict with William, so that in one battle - and a very easy one - they abandoned themselves and their country to servitude. For hot blood has no staying power; whatever it starts with a rush fails or is suppressed. In brief, the English of those days wore garments half-way to the knee, which left them unimpeded; hair short, chin shaven, arms loaded with gold bracelets, skin tattooed with coloured patterns, eating until they were sick and drinking until they vomited." William of Malmesbury, Gesta Regum Anglorum, ed. and trans. R. A. B. Mynors, R. M. Thomson and M. Winterbottom (Oxford: Clarendon Press, 1998), vol. I, p. 459. I like that William, who was a monk and a librarian, is pretty confident that Hastings should have been an easy battle. And he makes the English sound like modern football supporters. The weather this weekend has been beautiful, and even I - usually an avoider of heat and sunshine - was tempted to believe that summer can be a lovely thing, after all. What do we do here when the sun begins to shine? - sit by the river in Christ Church, with Dickens for company, and watch people punt by. Only a few of the people punting actually know what they're doing. They're the ones who stare at the water with a dogged, fierce concentration as if they're training for the Olympics; everyone else is muddling along in fits and starts, bumping into other boats, all cheerfully apologising to each other as they go. - drink Pimms in a pub garden in a little village which is only ten minutes' walk from the city centre, but which feels like the middle of the countryside. - sing (badly) in a chapel lit by stained glass, where for once the candles aren't the brightest light in the place, and which for once feels pleasantly cool instead of chilly. - eat in a busy, noisy, bustling dining hall, on benches packed tightly by lines of students in their black gowns. - play croquet in on a grassy quad as the dusk is falling. - read medieval history in a graveyard, because it's too sunny to stay in the library. I was reminded today of my favourite story about Cnut, king of Denmark, Norway, part of Sweden, and (most importantly to me) of England from 1016 to 1035. Even for a Viking, Cnut was seriously cool, and not just because of the size of that empire: he ruled in England (unlike some other Conquerors one could mention) with an emphasis on continuity in administration, law and religious practice which shows not just an ability to recognise the benefits of a sophisticated society like late Anglo-Saxon England, but also excellent political acumen. There seems to have been almost no rebellion against Danish rule after he became king. During his lifetime he kept his empire together with remarkable diplomacy and skill, not just by brute force; it only began to disintegrate after his death, which suggests a great deal about his personal strength of character. I'm quite attracted by the sense one gets from stories about him that he was given to grand political gestures, of which the most famous is the legend about ordering the waves to obey him to demonstrate to his followers the futility of earthly kingship. The wave story is probably apocryphal, but there's an earlier story which may well be true, since it is attested in some form in a very early source (the Encomium Emmae Reginae, an account of his life which is also fascinating for what it suggests about his relationship with his wife, the mother of Edward the Confessor). To me it's a particularly intriguing combination of Christian and what you might call natural justice. It might be relevant to bear in mind that Cnut may well have been a teenager at this point. 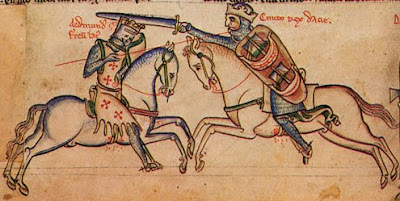 Background: in 1016, Edmund Ironside*, son of Æthelred the Unready, fought numerous battles against Cnut and his Danish army, but was eventually forced to agree to divide England so that he and Cnut would each rule half the country. Shortly afterwards Edmund was murdered, and his death was widely attributed to an Anglo-Saxon ealdorman, Eadric Streona. Eadric had been powerful under Edmund's father Æthelred, and in all the surviving sources, he has the very worst of reputations: treacherous and disloyal, always willing to betray his companions for the chance of personal gain, and blamed for various underhand political murders. Basically he was a really horrible man and a notorious traitor. Cnut and Edmund had agreed that when either of them died, the other would become king of the whole country. The story goes that Eadric saw the opportunity for a great reward from Cnut if he killed Edmund and helped Cnut to rule England, so he arranged for Edmund's death. Cnut then became king. Eadric went to him and reminded him what he had done, confidently expecting a high reward. He greeted Cnut boldly: "Hail, whole king, you who yesterday were only half a king; may you reward the promoter of your wholeness." Cnut, pretending not to understand him, replied: "Good God*, tell me who has been such a great friend to me, so that I may set him higher than all his comrades?" Eadric answered proudly, "Myself." Cnut called one of his earls to him and said, "This man shall be paid what we owe him," and said to Eadric, "As a reward for so great allegiance I will set you higher than all the leading men of the English." He immediately took up a battle-axe and cut off Eadric's head with one blow, and ordered the head to be set on a stake on the highest tower in London. Highest, get it? Classic Viking joke. * best nickname ever? I think so. "After the siege of Durham in 1006, Earl Uhtred placed the heads of the slain round the walls after the heads had been washed by four women. To each of the women he gave a cow as the reward for her labours." During the election campaign, and in the days since the new coalition government was formed, there has been a lot of talk in the media about the fact that so many of the Cabinet went to Oxford. Magdalen College alone has produced five ministers in the new Cabinet; not only the Prime Minister but the Chancellor, Home Secretary and Foreign Secretary were all educated at Oxford. Every profile of David Cameron is careful to point out that he went to Brasenose after Eton, and people who knew him there have hastened to share their memories of him as a student. So let me tell you what I know about Brasenose. It is a wonderful place to have been educated; I think it's the very pinnacle of what an educational community ought to be. I didn't come to Oxford from the same background as David Cameron - none of my family have ever been near a public school (let alone Eton!) and none of them had ever been to Oxford before me, nor ever hoped to. I came to Oxford knowing nothing more about it than what I had read in books, and just hoping it wouldn't be as snobby and unwelcoming as I had heard. And for a little while, unfortunately, it was. During my first two years at Oxford I felt very much on the outside, though intellectually I was very happy and fulfilled. The place seemed to be populated by over-privileged, over-confident adolescents - with all the immaturity and selfishness that implies - with more money and freedom than brains or common sense. Their belief in themselves was endless; their intelligence was not. ...that low door in the wall, which others, I knew, had found before me, which opened on an enclosed and enchanted garden, which was somewhere, not overlooked by any window, in the heart of that grey city. I found that door when I came into contact with Brasenose. This is my sixth year in Oxford, so I've had plenty of time to see its best and worst characteristics, and Brasenose has a lot of both; but a large part of the good I've had here, and the progress I've made here, has been directly or indirectly down to Brasenose. Yes, it has a lot of students from public schools, and many of them are, indeed, over-privileged little twits. Yes, like all Oxford colleges, it has traditions which to the outside world may seem archaic and arbitrary - and it has a funny name! If you peer in from the street, you may well assume it's intimidatingly stuck-up and oppressively posh. It's not. It's a welcoming, friendly, happy place, collegiate in the best sense of the term. It's the ideal of what an academic community should be, where people are encouraged to share their own ideas and are eager to learn from the ideas of others. The students - many of them from public schools, many of them not - are bright, confident, creative, open-minded, original and full of energy. You can't help but admire them. I can only hope that in twenty years, some of the people I know right now at Brasenose will be running the country. If David Cameron was anything like these kids when he was here, there's some chance that he will be a good Prime Minister. ... I want you to know that you can do whatever creative things you like with Oxford geography. It gives me great pleasure every week to see what you come up with. I love it when the characters drive down blocked-off roads or park in illegal places or turn the corner in one college and end up in a different one; that's all fun. But, contrary to what you attempted to make me believe this week, devoutly Catholic teenage boys do not wear t-shirts with pictures of the Virgin Mary on them. Nor do they wear rosaries as necklaces! Never, never, never. Also, it's been two weeks in a row now: you've shown Catholic priests pottering around in pretty, medieval churches. Catholic churches in England are hardly ever medieval. You see, there was this thing called the Reformation, and all the photogenic pretty churches now belong to the Church of England. If you want to show a Catholic church or chapel, it will probably have been designed in the 1960s; it can be Victorian at the very earliest, but no earlier. If you show me a Catholic priest hearing confessions in a medieval church with a lych-gate by the village green, I will wonder what alternative reality you're living in. Because I would like to live in it, too, please. Or even more appropriately, a post-election hymn, by G. K. Chesterton. I stayed up all night to watch the election results, which at the time was great fun, but now I'm finding it all very depressing. And not just because I'm sleepy. There's nothing better than a medieval spring poem. That al the wode ryngeth. The fenyl and the fille. Ase strem that striketh stille. For love that likes ille. So wel hit wol hem seme.